Sterling Gun Drills Vermont facility stocks a complete selection of stationary and rotary toolholders that fit standard and CNC machine tools. Most Sterling Gun Drills drills can adapt to these toolholders with available reduction sleeves. Reduction sleeves are stocked to help keep toolholders to a minimum; special toolholders and reduction sleeves can be made to order. A product for the use of gun drills and other coolant feed tooling on machine tool spindles without coolant through capability. Spindles include wood or metal cutting lathes, milling machines, drill units, and other machinery that can be suitable for the use of gun drills and other coolant through tooling but do not have through spindle capability at present. Universal Rotary Coupling, part number RC-38, supplies air, spray mist or coolant into any spindle with a through hole. Very compact, light weight, re-buildable, and simplicity are key elements of its design. Attachment is through the center of the machine tool spindle free of any involvement and/or possible contamination of the spindle bearings. The unique design rotates the coupling's housing keeping the spindle stationary, so no anti-rotation bar is required. Just one shielded ball bearing and a light contact seal generates minimal heat from friction. 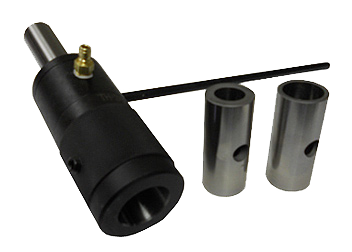 The TH-38 Rotary Toolholder has a 1" straight shank with a 1 1/4" bore. Two Reduction Sleeves, RS-57 and RS-58 reduce the toolholder's 1 1/4" bore to 3/4" and 1" respectively. The TH-38 toolholder is suitable for use with our DM2000 and DM3000 Spraymist Kits and is also capable of supporting direct oil or oil based water soluble coolant to a pressure of 250 - 300 psi. For the first time Sterling offers a true “inch“ series Rotary Toolholder to fit standard gun drills from 1/8" to 1" when used with the RS-57 and RS-58 Reduction Sleeves. 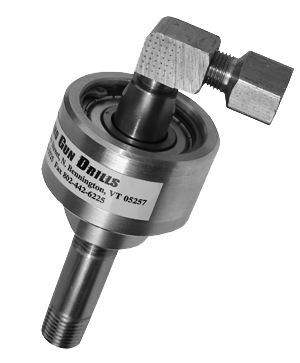 To use this toolholder, gun drills greater than 1" diameter must be ordered with a 1 1/4" driver (ref. "D"). If used with our Spraymist System, drill diameters over 1 1/8" must be ordered with "inner tube construction".